I met him in January 2010. I remember when he came to church for the first time. I knew he was coming because his cousin really wanted him and his other cousin to come to church, and they finally did one Sunday morning. I already knew bits and pieces about who he was at that time, and I knew that I didn't want to be a part of that. However, when I saw him at church, I, of course, wanted to make him and his cousin feel welcomed for being there for the first time. My then best friend's twin brother and I went up to meet them after worship was over. I still remember how he looked like clearly: he was wearing a snapback in church with a black jacket and his iPod headphones in his ear. His cousin was sitting next to him listening to music with him. You knew that they didn't want to be here. "Hi, I'm Kriselle," I said, with a smile. "Hi, I'm --" he got cut off. It was so loud in the room that I couldn't hear what he was saying. I embarrassingly asked a few more times what his name was before just saying "okay" so he didn't think I was stupid. His cousin introduced himself as well and that was that. I didn't pay much attention to him after that until he started getting involved with the youth group over the course of the next few weeks. I started noticing a change in him--he started talking differently, he started hanging out with our youth group more, and he said that he had stopped doing the things that he used to do. I started observing him from afar--we were friends, but we weren't best friends or even close friends by any means--but there was something about him that made him stand out to me out of all the other new people in our youth group at that time. I was intrigued by his testimony and how quickly he turned his life around. He was so nice to start inviting me to hang out with him and other people from our youth group. He was the oldest in the group and the only one that could drive at the time so if people wanted to hang out, they all looked to him. It started off with my best friend and I going with him and a couple others to Target on Friday afternoons before church to kill time. Then we started getting invited to group chat rooms and I started to get to know him on a more personal level and as a better friend. A few weeks have passed, and it is now the end of May. He just came back from retreat with a few others in the youth group. As I was singing on stage, I saw him come into the room and worship God with tears of joy. I'd never seen a new Christian worship God the way he did. I felt a strong pang in my heart that I hadn't felt in a while. I was still getting over an ex boyfriend so it felt weird to think of him outside of the context of church. I began to acknowledge my attraction towards him throughout the next few days even though it felt weird because I still felt so tied down to my ex boyfriend who had broken up with me 9 months before. I hadn't mentioned to anyone how I was feeling, but I figured the best person to talk to would be my best friend. So I called her. "Can I ask you something? But you have to be totally honest!" She laughed, "Okay, what is it?" I asked her who she would date in our youth group if she had the chance. She made me admit what I was thinking first and I said him and his cousin. She said the same thing. We both decided to try and find out from them who they were attracted to. She asked the cousin while I asked him. He later admitted that he would date me or another girl in our youth group if he had the chance as well. And that's when everything changed. It is Friday, June 4th. I hung out with him and a few friends as usual, but we went to church early to hang out. He offered to give me my first driving lesson (I was 15 1/2 at the time) around my neighborhood. I hesitated and said yes because I had never been behind the wheel of a car before, but I thought it would be fun since we'd be in a quiet, residential area. He was patient with me and helped me maintain my speed and also make my first u-turn at the end of the cul-de-sac. I was too paranoid so he took the wheel and turned the car for me. My heart raced a little and hoped that he didn't think I was slow in learning. There was a different atmosphere at church that night and I wasn't quite sure why. I decided to flirt with him a little bit and see if he'd flirt back, and he did by poking and tickling me throughout the night. However, I got a little scared towards the end of the night because I didn't want to put myself in danger of getting hurt again like my last boyfriend. Saturday, June 5th, a bunch of us decide to hang out. I still had no idea what he thought of me at this time, but his cousin kept teasing me that he knew what he thought. It made me feel like that maybe he liked me because of that, but I didn't want to be too sure. We all went to the mall and came across a "5D" theater, where there were 20-minute films and the screen wraps around the audience and is in 3D for a "full" experience. The guys decided that they wanted to do it and watch the scary film showing, and of course my best friend and I said no and that we didn't have enough money for it. The guys paid for us and we are forced to go in with them. I hate scary movies, so I turned to him and start to chicken out. "Oh my gosh, what did I get myself into?! You better protect me!" He reassured me, "Don't worry, I got you!" and I quietly smiled to myself, hoping that he did. I wonder to myself if he set up the situation to be like this so that we could be close, but I didn't dwell on it too much as we were being let into the theater. I wanted to be close to him and for him to protect me even though I still couldn't imagine him as anything more than a friend. At that point, I was just happy to hang around him. We took our seats in the available stools (since the screen wrapped around) and we faced each other. I was grabbing onto his arms and liked the feeling of being protected by him. The film starts and I immediately look down out of fear and grab him tighter. He shakes me a little and asks me to look up, but I resist. "Kriselle! Look up just this once! I'm right here!" I shake my head. "No, I don't want to!" "Just do it please? Come on!" I look up just a little but hold tighter to cut off the circulation in his arms in case I get scared. I instinctively jumped out of habit, but nothing had popped out yet. I quickly buried myself into his arms for the rest of the movie. At that point, I wasn't sure what I was even doing. However, the rush of him protecting me while screaming and holding onto him gave me a rush that I hadn't felt in a while. A couple hours later after wandering around the mall, mostly everyone said that they needed to go home. So we all piled up into his car and dropped everyone off at home. I stuck with him and his cousin (the one that came to church with him that day) because we lived in the same area farther from everyone else but didn't want to go home yet. The problem was figuring out what to do next. "Where do you want to go?" he asked. "I don't know, you're the driver," I said back. After thinking a minute or two, he asked another question. "Have you ever been to Skyline?" "I've heard of it! But I've never been." "Okay," he says as he starts his car, "We're going there." As we drive to Skyline, I wonder what it is going to be like. I'd seen pictures from friends but had never been there myself. I was also curious as to how the night was going to play out since he and I weren't a thing and his cousin was there too. We get to the bottom of the hill of Skyline, and we drive up. The sun had just set, so it was already dark out and the lights of the city were all on. I looked out the window to see all the lights and was a little awestruck by it. We park the car and as soon as I step out of the car I start to shiver. I was only in only a shirt and shorts, and since we were at the top of a hill, the winds were stronger. I shiver, "I'm so cold! It's freezing up here!" He saw my poor self shivering and asked, "Do you wanna borrow my cardigan?" My face lit up and although I'm unsure if I looked stupid or not, I smiled big and replied with a simple "Yes!" He went to the trunk of his car to grab the cardigan and his cousin brought out the camera. I wanted to take a picture with him up there because it was my first time and because of my crush on him, but I didn't want to just flat out ask. So after he handed me his cardigan, I put it on, still shivering, but at least my arms were covered now. We all walked over to the edge of the hill to look out at everything and it just took my breath away. I'm still shivering and lowkey trying to get him to hug me, but I didn't want to be too obvious about it. "Here, let me take a picture of you burnts," his cousin then said. The term "burnt" was a term the guys in our youth group coined for people looking or acting like a couple together. 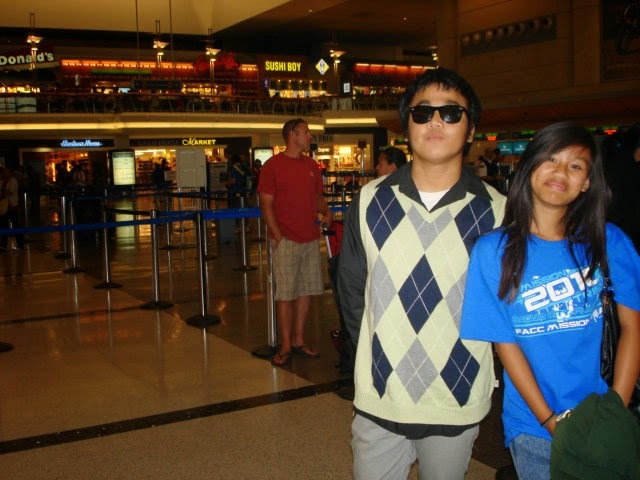 He awkwardly put his arm around me and instead of doing the same, I just kept my hands to myself and smiled weird. We took a picture with and without flash, but we kept the one without the flash because you could see the city lights in the back. 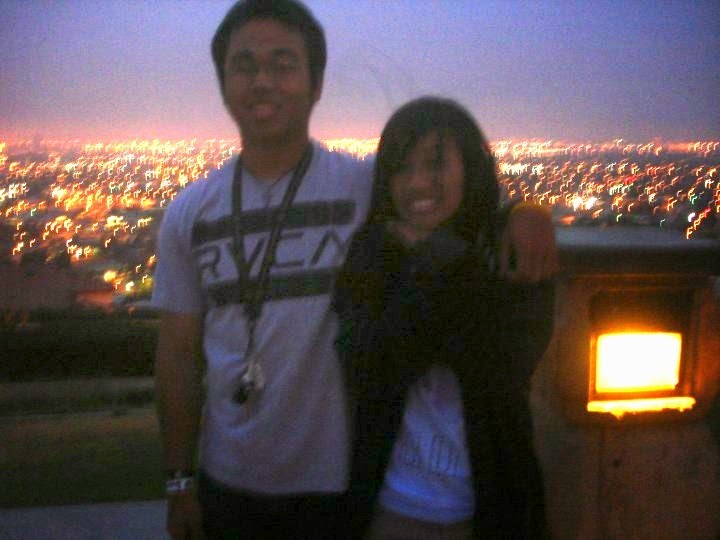 After his cousin took the picture, we stood up there and admired the city for a bit. We decided that we were hungry and cold after a few more minutes and went to Denny's. We drove down the hill and I just sat in silence, feeling relaxed after seeing the beauty of the city. We got to Denny's and sat down, all ordering breakfast for dinner. When we got our drinks, I tied the paper for the straw into a knot, like I always do. It's something my friend and I always did because we thought that if it knotted, then someone was thinking about us. It knotted, and I said out loud that someone was thinking about me. Our thoughts all immediately went to a guy that we all knew that liked me, but he mumbled something loud enough so that only his cousin could hear. "Nothing!" The boys said with a smile and laughing. I was left confused, but decided not to say anything more about it. I later found out from his cousin that he admitted that it wasn't the guy thinking about me, but that it was him. After talking and laughing and eating for another hour or two, the guys finally dropped me off at home and I went to bed not long after. I texted him before bed and thanked him for the day and said goodnight at midnight. Sunday, June 6th, I texted him good morning right when I woke up. He greeted me not long after and told me that he couldn't sleep until 3am the night before. "Aww, why couldn't you sleep last night?" I asked. "I was thinking," he said with a smiley face. I couldn't help but smile to myself and reply, "What were you thinking about?" "Something..." he said again with a smiley face. I dropped the conversation not too long after that and we saw each other at church a little later that morning. It was like any normal Sunday, except my heart was racing faster than usual. He dropped me off at home after church and I hesitated to give him a hug, so I didn't. I smiled at him and awkwardly told him bye. I then took my stuff and went into my house. His cousin had told me a few hours before that he was attracted to me like I was to him, and that we both should just admit that we liked each other. I didn't want to because I was scared, but I decided to take a chance. I texted him after he dropped me off and admitted how I felt. "Hey. Thank you for dropping me off!" "Of course, no problem!" he replied. My heart felt like it was going to burst as I texted out the next few words. "I just wanted to tell you that I really like you. I didn't want to admit it before because of my ex, but after the past few days and hanging out with you, I realize that I do." After hitting that "send" button, it seemed like an eternity until he replied, but I was so relieved and anxious when he finally did. "Wow, really? I like you too. Yesterday, when we were at Skyline, I really wanted to hug you to keep you warm, but I wasn't sure what you would think so I just didn't. And I completely understand why you're guarding yourself, and I am here for you." We talked for a little longer after that until he brought up what we were. We still weren't completely sure yet, but we still talked about a date to mark the day our lives changed forever. Okay, so we weren't that corny about it, but he asked me what our "date" should be. "So, what should our establishment date be?" he asked. I had never heard of the term before, but I laughed at the idea of it. "Hm. How about yesterday, June 5th? I feel like with everything that happened yesterday, that should be the date." He texted me back, "Okay. June 5th is our establishment date!" Four years later, I am sitting at my computer, writing out the story I had put off writing for almost three years now. As I look back on the old pictures and read old blog posts we both made about each other long ago, I can't help but be so grateful for this amazing human being I call my boyfriend. The past four years have been crazy and a rollercoaster, but I am excited for what is to come in the future. I love you, Darell Gabriel. Oh my gosh, this is beyond adorable! Congrats on 4 years-wowza that's a long time! Truly adorable :) Thank you for sharing! 4 years! That's absolutely amazing! I can't wait till my boyfriend and I reach that mark. Y'all are super precious together. Congratulations and happy anniversary! Awww, cute! I smiled while reading this. Happy anniversary and I hope you too enjoy your day! Awww ^_^ Wicked cute story! And congrats on the four years--seriously impressive! Thank you so much, Tiffany, you're a doll! It'll feel great when you guys get to this point! Awwww! This is too SWEET & reminds me a bit of me & my boyfriend; despite we met on EHarmony, he was SO shy our first month of dating that I thought we would just be friends, then finally after a gorgeous day at The Getty, he asked to hold my hand, then the next date he asked if November 30th, when he had me over for dinner, could be our 'official' anniversary of a couple :) Congrats to you both! Aw ♥ Kriselle, I'm cheesing so hard right. :) Haha, this is precious! And I love this storytelling form of writing. Thank you so much, Mary! That is so awesome, I love hearing about people's love stories! Thank you for reading my story and sharing yours! This makes me want to write up the story of my husband and I meeting! Very inspirational!